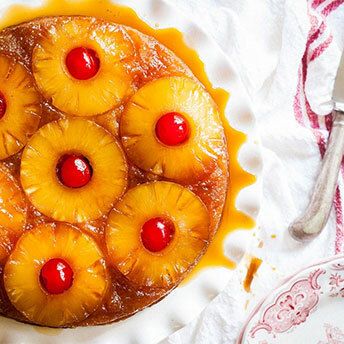 This Upside down Pinneapple cake is one of the many version of Pinneapple Cake recipe made on the islands of Curacao, Aruba, and Bonaire. It is a very delicious cake and surprisingly easy to make. Enjoy ! Melt the butter on low heat in a pan. Sprinkle 8 tablespoon of brown sugar on it. Divide the pineapples over the sugar layer and place the half cherries in the middle of the slices. In a mixer bowl add the eggs with the 1.5 cups of sugar and turn of the mixer on medium speed. Add to the eggs and keep mixing until you get a uniform batter. Pour the batter carefully over the pineapple slices in the baking pan and put it in a preheated oven. Let the cake cool for 10 minutes and cut the edges with a table knife.